The name of the gem-engraver Dioscourides (ΔΙΟCΚΟΥΡΙΔΟΥ) is inscribed in the field below the scene. The name is in retrograde. 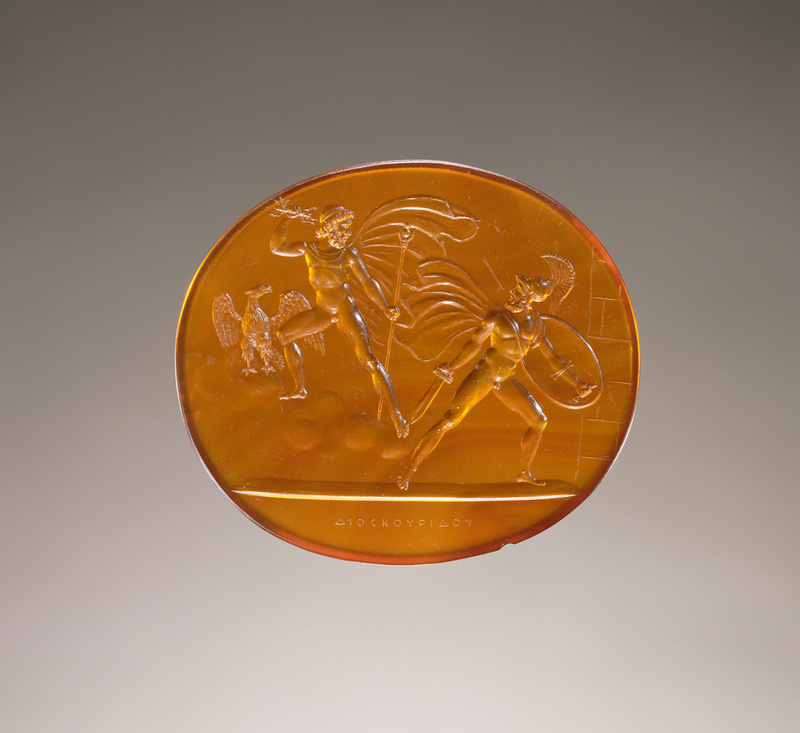 The scene engraved on this gem depicts a mythical combat. On the right, Zeus, king of the Greek gods, strides on the clouds, while preparing to throw the thunderbolt he holds in his raised hand. In his other hand Zeus holds a scepter; behind him stands an eagle, his symbolic bird. Zeus is about to punish Kapaneus, one of the seven heroes who attempted to conquer the Greek city of Thebes. Kapaneus climbed the city's walls, boasting that not even Zeus could stop him; he was destroyed for his presumption by Zeus' thunderbolt. Written in Greek below the picture is Dioskourides, the name of the artist who engraved the seal of the emperor Augustus. The name was inscribed backwards so that Dioskourides would be legible when the gem was used as a seal, and the design stamped into a soft material such as wax. The gem's decoration and details, however, do not resemble the genuine works of Dioskourides or ancient Roman gems in general: this gem is an outright forgery. It once belonged to Prince Stanislaus Poniatowski of Poland, whose collection of more than two thousand gems in the late 1700s and early 1800s largely consisted of beautifully executed fakes. Estate of Eli Djeddah, American, 1912 - 1981, by bequest to the J. Paul Getty Museum, 1983. Prendeville, James. Explanatory catalogue of the proof-impressions of the antique gems possessed by the late Prince Poniatowski, and now in the possession of John Tyrrell, Esq. (London: H. Graves for the proprietor, 1841-42), no. 561. Thompson, Erin L. Possession: The Curious History of Private Collectors from Antiquity to the Present (New Haven, CT: Yale University Press, 2016), pp. 72-73, fig. 7.